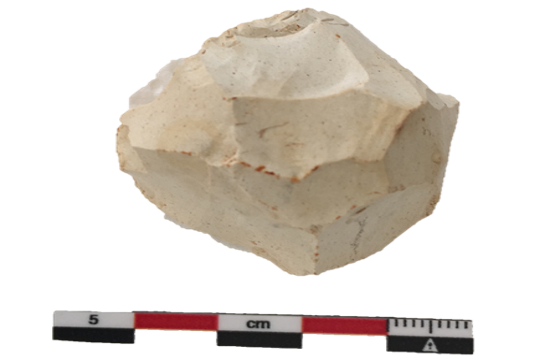 Cyprus Department of Antiquities, Ministry of Transport, Communications and Works, announces that the Tremithos Neolithic Survey under the direction of Dr Sarah Stewart (Trent University Archaeological Research Centre) completed in May 2018 the surface survey of the Tremithos River Valley. The pedestrian survey focused on the area along the coast east and west of the Tremithos River Delta and north of the Kiti Dam to the Larnaca-Limassol Highway. All diagnostic finds were catalogued and photographed and submitted to the Larnaka District Museum. The survey area with the highest potential for in-situ early archaeological material is located just east of the promontory at Limnes, with high potential for both Roman and Epipalaeolithic material, the latter including two microlithic multi-directional cores and numerous retouched flakes from a variety of chert. This is the most promising location along this coastal region for a potential Epipalaeolithic site, based on the recovered lithics and the fact that there is evidence of a small stream that would have flowed into the sea. The stream is currently buried under approximately one meter of well-developed soil at the stream outlet, which is marked by water worn cobbles.